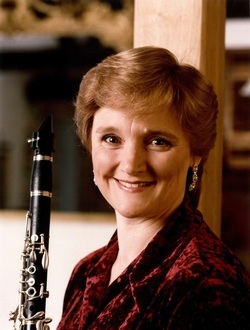 Joy is a founder member of the Haffner Wind Ensemble with whom she has broadcast and toured widely and currently holds the position of Principal Clarinet with the Britten Sinfonia. As a recitalist she has appeared at music societies and festivals all over Britain, as well as in Spain, Australia, Finland, and Norway. She has performed with some of the world’s finest string quartets and appeared at Festivals including Aldeburgh, Cheltenham, Kuhmo, Crusell, Stockholm, Leicester and Cambridge. Joy has had special success as a recording artist, particularly as a Mozartian. This includes Mozart Clarinet works on three discs, the Strauss Duet Concertino for EMI, two Mozart discs for the Classic FM label, and chamber works for both Chandos and Hyperion. Most recent is a disc of Italian Bel Canto Concertos with the Britten Sinfonia on ASV. Joy Farrall has been Professor at the Guildhall School of Music and Drama since 1985 as well as teaching in master classes both at home and abroad. In September 2010 she took the post of Co-ordinator of chamber-music for the Wind, Brass and Percussion department.